What amazes me with Koei Tecmo’s Warriors franchise in recent years is just how good the company has become in distinguishing each new title from what came previously. It is, after all, a series that was once erroneously chalked up as an endless stream of samey button mashers (and still is in some quarters). It almost seems like a deliberate response that Koei Tecmo now goes out of its way to do something completely and comprehensively different with each new release. Related reading: Another licensed Warriors title based on an anime franchise worth considering for PlayStation 4 owners is One Piece: Pirate Warriors 3. Nick's full review. 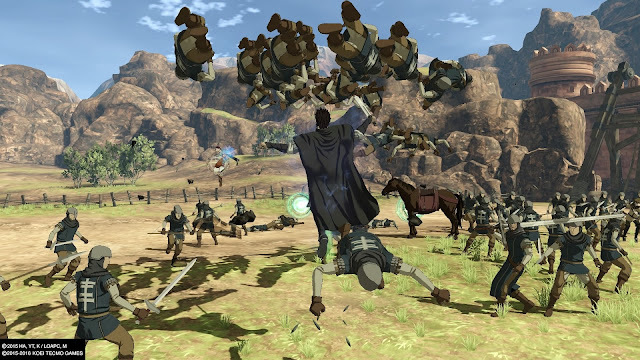 Hyrule Warriors on the Wii U, for example, is a very different title to Dynasty Warriors 8 Empires, and that too is completely different to a Warriors-in-all-but-name Dragon Quest Heroes. The latest Warriors title, Arslan: The Warriors of Legend, is also quite different to what has come before, and what this one offers has made it one of my favourite games in one of my favourite franchises of all time. I knew nothing about Arslan before getting into the game. I vaguely understood that it was a series of novels by a well-known author (Yoshiki Tanaka), and those novels were being turned into a manga and anime franchise that was proving to be quite popular itself. But while I was certainly intrigued by the idea of a Japanese fantasy epic set in the Middle East, this wasn’t one that I had had the time to get into myself (in fact I'm not even sure if the novels have been translated into English). So I went in as a blank slate. And the first thing that truly impressed me about the game was just how well it brought me up to speed. 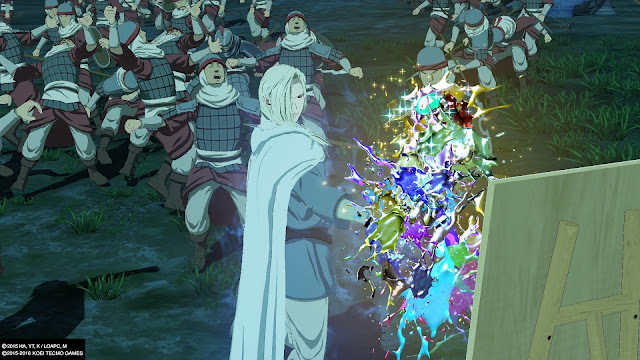 Rather than arbitrarily break battles up into individual “levels,” as happens with most Warriors games, Arslan uses plenty of narrative and cut scenes between conflicts to get players really involved in the action, and it tells a single, cohesive story with which players are seamlessly transitioned into and out of battle. These cut scenes are generally quite simple, with most of them little more than dialogue imposed over a series of still images. The effect is almost a highly aesthetic storyboard in fashion, but what is remarkable is the confidence that the team at Koei Tecmo had to spend the time and tell a proper, even at times lengthy, story. In playing Arslan, even as someone who had never experienced the franchise before, I was given a genuine sense of its important characters. Not just in the way the characters dressed and fought on the battlefield, as happens with some Warriors games, but in the way that they interact with one another. They banter, debate, and strategise with one another in such a way that I found myself playing through battles as much because I wanted to get to the next cut scene as anything else, and that’s perhaps a first for the Warriors franchise. And it was important for Koei Tecmo to do this, because at its core, Arslan is a grand, character-driven, pulp fantasy in a very exotic world, and it needed the context of characterisation to really give the overall experience impact. I was reminded of novels such as R.A. Salvatore’s Drizz’t Do ‘Urden Dungeons & Dragons series, or even Lord of the Rings, as I played through this one, where each character within small team brought something unique to the party, and then those characters worked together to overcome overwhelming, impossible, odds. The sense of camaraderie that runs central to these stories is perhaps a cheap tactic to get fans to keep coming back to the series, because who doesn't want to commit to following a bunch of characters that are giving them the warm and fuzzies? But, while it might be a cheap tactic, it's undeniably effective. I'm writing this and a collection of two dozen odd R.A. Salvatore books are staring back at me from the bookshelf. They're nonsense fun, but the feels, man. The feels. Anyhow, I digress. Arslan's characters really help to drive home something memorable, because the broader narrative is really quite simple. It tells a story of betrayal of the highest order, and a young prince’s subsequent for revenge and to reclaim his throne. There aren’t too many themes that Arslan explores that we haven’t seen in other pulp fantasy novels, but it doesn’t really matter, because each one of the characters is as distinctive and memorable as those in other genre ensemble casts. So, yes, there’s a Frodo, a Catti-Brie and even a Pug. And if you know the three characters I’ve just mentioned there, than this game is even more for you. Because you already know full well just how enjoyable a good pulp fantasy hero can be. 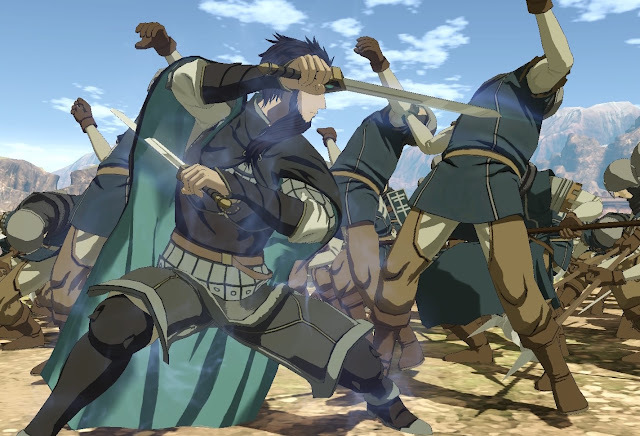 Related reading: Matt's preview of Arslan includes an interview with the game's director. Read it here. 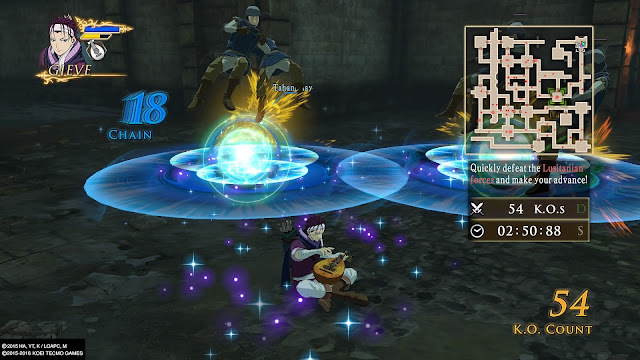 From the clever, cocky thief-like character, to the indomitable knight, the loyal squire, and the righteous and noble Arslan himself, each character has a distinctly different personality to one another, and this also means that they play very differently on the battlefield. 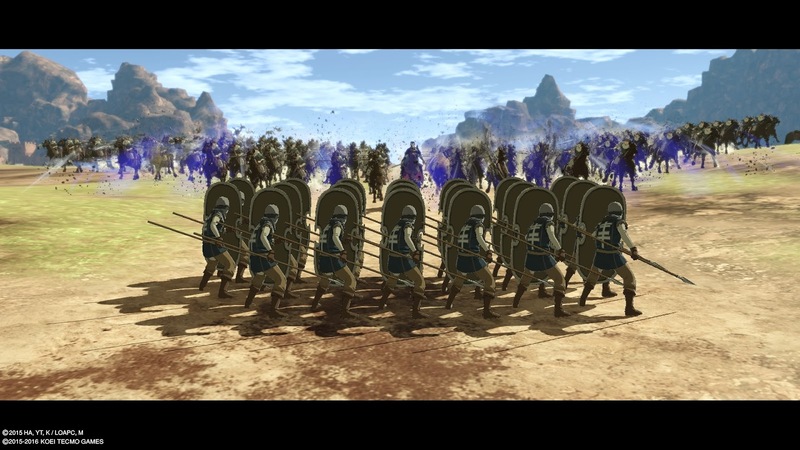 With the way the battles flow smoothly from one to the next Koei Tecmo was also able to throw in smaller event battles that wouldn’t have worked nearly as well in a more arbitrarily-structured game. For example; there’s one level where a character needs to sneak into a weapon storehouse and destroy the inventory before prince Arslan can be betrayed by the lord he was visiting as a guest. That level is used for a purely storytelling purpose and only lasts around five minutes, but it feels purposeful because in the very next scene the espionage has a major effect in how the battle plays out. The narrative is completely linear and players don’t get to determine how it plays out, but there’s a real thrill to leading a small party of heroes to cut a swathe through a horde of enemies. It’s a little like how the battle scenes in films like Lord of the Rings or The Avengers are so thrilling, because they featured small groups of heroes bringing their powerful abilities together in a way that the sum is greater than any individual. The setting helps, too, and while Koei Tecmo is more a facilitator than a creator when it comes to the setting (it wasn’t their creation, after all), it’s nonetheless something the developers have facilitated well, and it really drew me into everything that is going on. Arslan is based on a fantasy interpretation of the Middle East (for the most part, Persia). But, rather than a high fantasy, such as we see in stuff that takes inspiration from 1001 Arabian Nights, Arslan is a more “realistic” kind of setting, with characters wearing more naturalised clothing, and the sand-and-gold-castles of fantasy Middle East replaced with an aesthetic that you would be much more likely to see in the real Iran or central Asia; yes, there is grass in Persia. It’s not all yellow sand. It’s obviously still anime, but it’s a human, naturalistic approach to the setting, and I find that refreshing to the point of being unique; when the west isn’t busy vilifying the Middle East, it’s turning up the exotic themes up to their maximum. This is nothing of either. I love harem girls as much as the next guy, but to have here a game that exists in an identifiably “Middle East,” but is normalised, is really quite special. As with all Warriors games, the engine has a lot of characters to render in combat, so the actual environments tend to be simple in design. They’re attractive, with the gorgeous architecture the setting is well known for being the highlight, but it’s simple. Where the real wow factor comes from with this engine is the periodic opportunities to engage in a “rush.” Remember that breathtaking scene from the final Lord of the Rings film, when the cavalry army charges down the hillside to devastate the orc army? It works like that. There will be a spot on the battlefield where the players can enact one of these charges, and when they do so they will form an unstoppable wall of knights (and occasionally infantry or archers) that will mow down everything in their path for a period of time. Beyond the visual effect these charges are also the only way to break down some barriers, so even if they weren’t too cool to ignore, they’re essential for making progress. On-foot combat will be familiar to Warriors veterans, with characters having their standard range of light, heavy, and super attacks. What helps keep combat interesting this time around is that you won’t get to choose your characters before a battle; you’ll be stuck with whatever one the narrative decides you’ll be using. Rather than being a point for criticism (and you can use whatever character you like in the free battle mode afterwards), this works to Arslan’s benefit, because each character controls significantly different to one another, and thus by constantly switching between characters Koei Tecmo is able to keep the on-field experience varied throughout. Related reading: For the more fantastic take on fantasy Middle East, the harem costume can't be beat. Click on for a feature on the history and development of that costume. There’s also some limited character customisation systems to work through. Enemies can periodically drop “cards,” which can be equipped to characters to power them up. Each character only has a limited number of points to spend on these cards, however, and good cards cost more points than those that have lesser effects. So balancing out a good set of cards is pretty important for success; particularly at the higher difficulty settings. In most other regards Arslan is a fairly standard Warriors experience, but between the strong, epic, narrative, gorgeous setting, and the varied bunch of really enjoyable characters there is more than enough here to justify its place among Koei Tecmo’s growing stable of licensed work. Even those who haven never had anything to do with Arslan before can get right into this one, and given that the game was developed as part of a cross-media initiative to try and develop the franchise globally, I can’t see this being anything but a resounding success in that goal. … And now I rather want a Warriors: The Lord of the Rings game. C’mon Koei, make it happen!